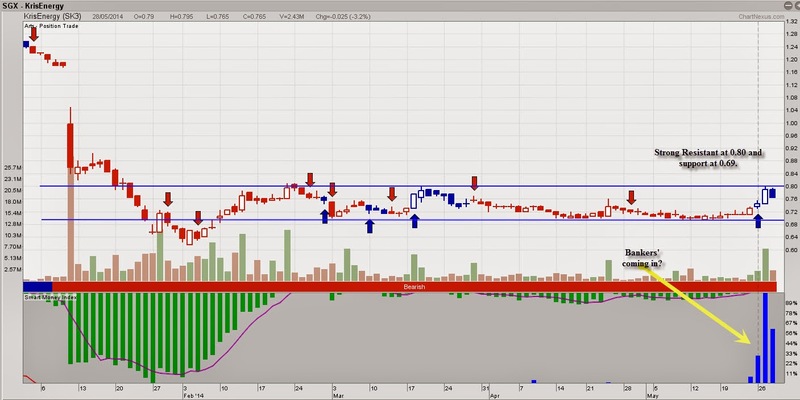 KrisEnergy, the price of this stock have been trading in side way for quite some time between 0.69-0.80. Strong resistant at 0.80 and Support at 0.69. This time the chart look different, is the bankers joining in the game? and will it break out? Let see how it perform ! KrisEnergy Ltd. is an independent upstream company focused on the exploration, development and production of oil and gas in Southeast Asia. KrisEnergy Ltd. was established in 2009 by our founders, who previously created and built Pearl Energy, a Southeast Asian oil and gas producer and explorer. Leveraging its expertise in Southeast Asia, and coupled initially with the backing of funds affiliated with First Reserve Management L.P., KrisEnergy embarked on a focused strategy of acquiring assets in countries and basins where our founders and technical team have extensive knowledge and experience, with the commitment to build a leading oil and gas exploration and production company in Southeast Asia. KrisEnergy Ltd.'s target focus area stretches from the Surma Basin in Bangladesh in the west to the Papuan Basin in the east, and from offshore southern China in the north to Indonesia in the south.